LinkedIn doesn’t get much love in the “I can’t wait to go online and have fun with my friends” category of social networking sites, but make no mistake – for professionals, wannabe professionals, businesses or non-profits, LinkedIn is where the real action is. While you may be getting benefit out of Twitter or Facebook, LinkedIn is probably where I’ll find you first when I google you and where I’ll look to get an early sense of your reputation. Still, with all the deals being made and careers blossoming on LinkedIn, it isn’t always top of mind when people think about where to spend time their time online. The secret to networking is to actually stay in touch with many of your connections. If we don’t occasionally connect, those connections might as well be a stack of business cards gathering dust in a dark corner of our office. Out of sight, out of mind. There are many reasons to stay in touch, but here’s a big one – People tend to remember people who remember them. Networking isn’t about us; it’s about them and anything that helps remind us of who we know or how we know them is a good thing. If it’s fun, even better. Enter three new applications which do just that. Oh, how I was addicted to playing Tetris. I tried to keep up with the increasingly fast pace at which those shapes dropped, hoping to fit them into the puzzle. 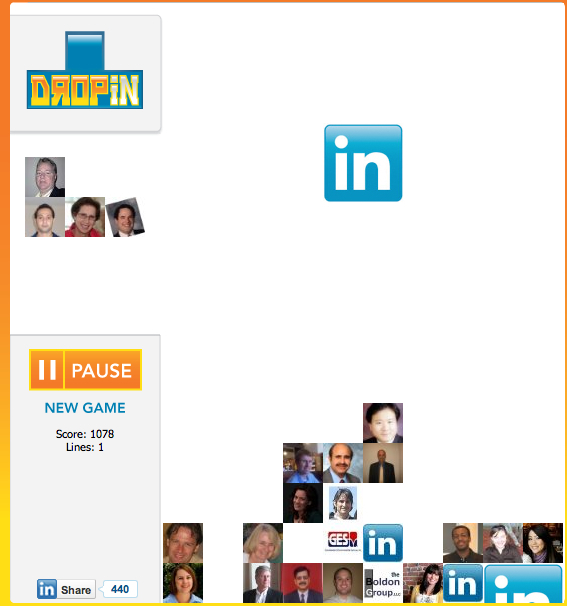 How would you like to play Tetris with the faces of your LinkedIn connections? My only challenge with DropIn was deciding whether to focus on the game or wondering why I hadn’t talk with George in so long as I tried to maneuver his face into just the right spot. I’ll have to send him a note – right after I finish this game. Which of your friends started a new job last year? 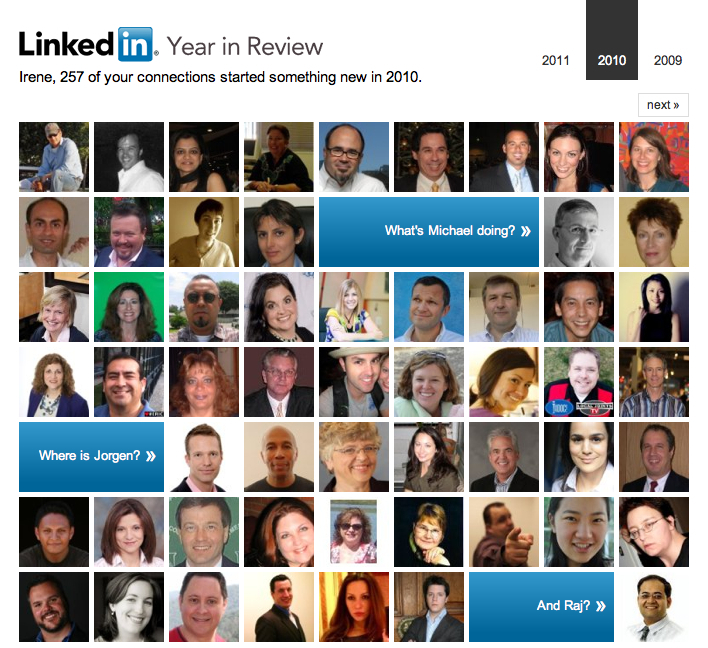 It turns out 257 of my LinkedIn connections started a new position in 2010. That’s exciting. I would certainly have missed this information otherwise. After being shown the faces of those with a new gig, it would be great to send them a note offering congratulations or asking how they’re enjoying the new job. What an easy way to let them know you’re thinking of them! The idea behind this application is cool, but it didn’t seem to work well for me. 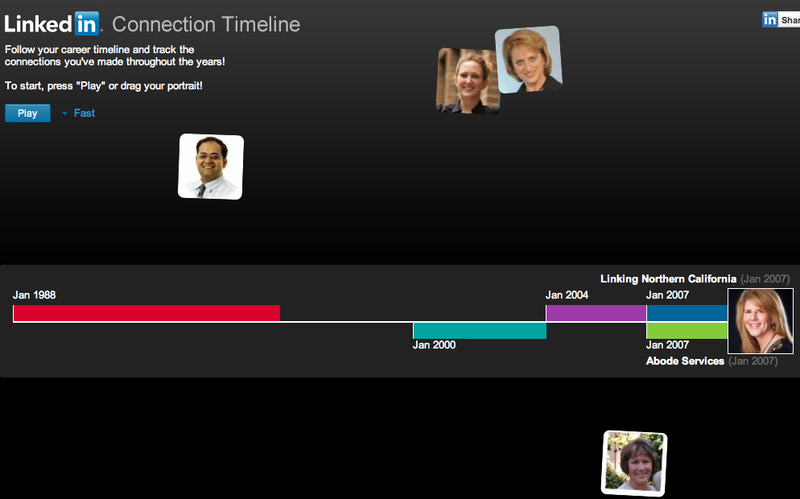 It displays your career as a dynamic timeline and highlights which of your connections you worked with at various points in your career. My timeline only displayed positions through 2007. Have you used any of these new applications? Let me know what you think and which seems most useful to you in the comments below. Love the first two. Thank you for highlighting them! I can’t wait to share. The timeline hasn’t worked well for me either. Hi Donna. So happy that you found the new apps interesting. I’ve heard from a few others who couldn’t get one or more of them to work. I’m not sure what’s going on with them, but I’d guess since they’re new and in beta, they may not yet be as stable as we’d like. Give it another try later on and see if that does the trick. Thanks for sharing the post!